Massive and rich aromas of dried, candied fruits - plums, dark cherries and figs. Heavy load of sherry, nicely mixed with orange zests and Demerara sugar. Rum soaked raisins and dates arrive with lingering notes of Christmas cake and walnuts. Subtle cinnamon and a bit of oak with a pleasant touch of tobacco leaves and cigar box in the back. A constant change of flavours from fruity, sweet to bitter/herbal and back again. The alcohol is very well integrated. A rich and complex nose! Wow - this is strong, rich and intense on the palate! A massive load of sherry, mixed with concentrated dried dark fruits, rum notes, and Demerara sugar. This is complemented by a warming spiciness of toasted oak, cinnamon, and ginger. Once this warmth fades, sweet and creamy notes of dates and oranges arrive, pleasantly lingering with dark chocolate, dry oak, cedar wood and walnuts towards the finish. The finish is endlessly long, voluminous, chocolaty-sweet with fine nutty aromas and slightly bitter tobacco notes. Lively and fresh on the nose when a splash of water is added. Still lots of sherry with dark fruits and some more spicy and herbal flavours in the back. Quite lively on the palate. Vibrant with prickling oak, fruit and warming spices - mainly ginger and pepper. Fruity and bitter sweet towards the finish. The finish lasts very long with caramel, milk chocolate and drying notes of oak, tobacco leaves and walnuts. 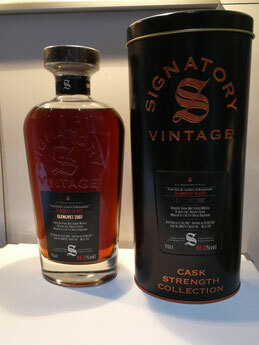 Wow, this is a brilliant dram - a real beast! A sherry beast with an explosion of aromas. Lots of fruit, sweetness and a massive load of warming spices, which is all in constant change. For only 10 years very well balanced, mature and pleasantly drinkable. The high alcohol content of 66.6% is noticeable but not pungent and doesn't disturb at all. On the contrary, the alcohol throws the abundance of aromas in the nose and throat, so that you can still feel the beast on your tongue the next morning. An outstanding single malt - at least to me!